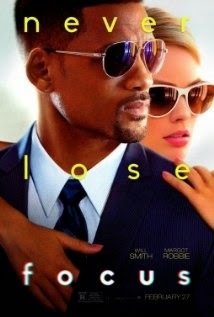 Focus is about con man named Nicky (Will Smith) who has been a con his whole life. When a pretty woman named Jess (Margot Robbie) shows up in his world of stealing he falls in love but when things get good he has to let her go before they can get too close. Well, they end up catching each other's gaze once again and that's when it gets fun. Focus was not what I was expecting and I found it really enjoyable. There was a mix of comedy and deception and that's what really reeled me in. I laughed, thought, and tried to figure out how the con was gonna go down. There's a scene where even I didn't know what was going on and had my hands pressed to my face wondering why is this happening, why is he doing that and why doesn't he just stop? Also, if you want to learn how to steal little things like watches, wallets, hats, or rings you could get some tips. It's pretty neat how, by distracting certain areas of the body, you can take almost anything from someone. Will Smith recently said his last movie, After Earth, was one of the worst he's ever done, but Focus was a hit and better than expected. He was amazing. Margot Robbie (Wolf of Wall Street), aside from her great looks was also a great pair up with Will Smith. She plays a con in training with a lot of natural talent for lifting items. There was comedy throughout Focus, but the real stand out was an actor by the name of Adrian Martinez. If he doesn't make you bust out in laughter from the things he says then I don't know what will. Get the latest Hits in your inbox!